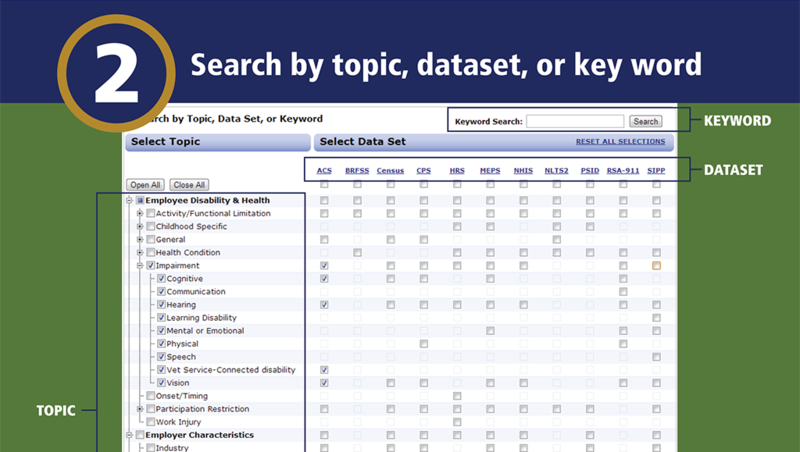 Browse or search across 11 major datasets for variables related to: disability and health conditions, work and employer characteristics including compensation such as pay and benefits. The catalog provides: variable names, survey questions, response categories and related variables that can be exported into an excel spreadsheet for your use. 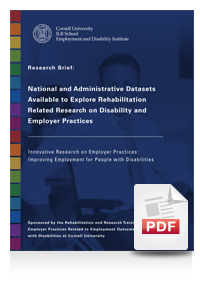 A number of large national and administrative datasets collect rich information on a range of topics that can inform specific rehabilitation research and policy questions. However, for those who desire to use these files, it has traditionally been an arduous task to learn their finer details. 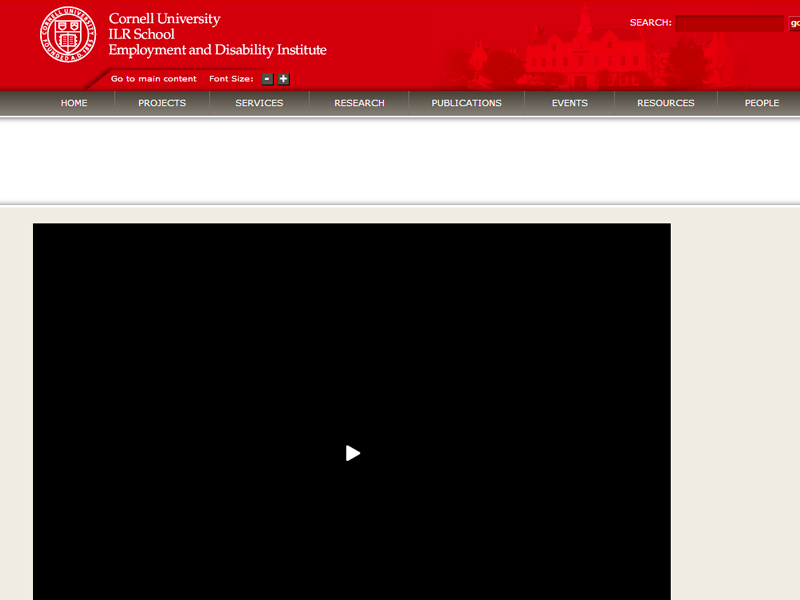 A new online catalog compiled by the Cornell University RRTC team enables researchers to more readily understand the variables contained in these files and to assess which subset of files contain similar measures for cross-data comparison studies. 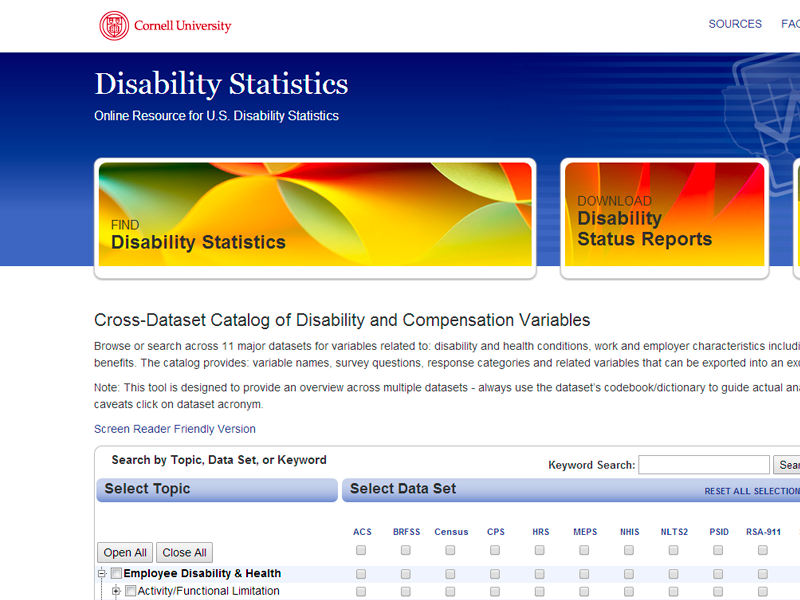 Browse or search across 11 major datasets for variables related to: disability and health conditions, work and employer characteristics including compensation such as pay and benefits. The catalog provides: variable names, survey questions, response categories and related variables that can be exported into an excel spreadsheet for your use. This tool is designed to provide an overview across multiple datasets — always use the dataset's codebook/dictionary to guide actual analysis. To view dataset descriptions and caveats click on dataset acronym.